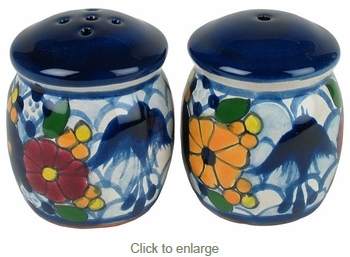 These Talavera salt and pepper shakers are a unique and colorful addition to your kitchen or dining room table. Our Talavera tableware and serving pieces are lead-free and safe for serving food and using as dinnerware. Talavera is dishwasher and oven safe. All of our Mexican Talavera dishes and serving pieces are handmade and hand painted by Mexico's talented potters. You will receive the pattern and color shown. See other available colors and patterns in our Talavera Patterns section.